Primarily the poor and vulnerable are exposed to the adverse effects of climate change related to sudden-onset extreme weather events and slow-onset events and processes such as sea-level rise and desertification. Many of them are “trapped” others can and have to move. Thus climate change is a key driver for human mobility, as confirmed by ongoing studies of the World Bank. To protect those most at risk, humanitarian and development actors need to adapt their traditional approaches and governments of affected countries need to become more pro-active risk managers. This calls for comprehensive approaches to reduce climate and disaster risks, including displacement risks, to promote risk prevention and transfer and to address challenges when people move or have to move because of the effects of climate change. 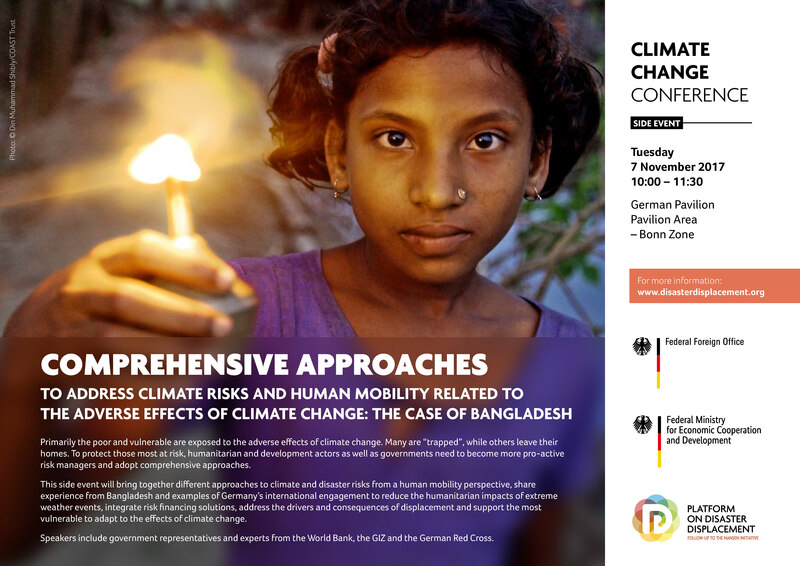 This side event will bring together the current discussion and deliberations from three approaches to climate and disaster risks: 1) anticipatory humanitarian assistance, 2) climate and disaster risk management and 3) addressing disaster displacement. Within humanitarian assistance more anticipatory action is needed from donor countries and humanitarian organizations to deal more effectively with increasing climate risks. Anticipatory approaches, such as Forecast-based Financing, have the potential to enable the implementation of early actions to use available humanitarian funding more efficiently. These mechanisms need to be integrated in a systematic way to enable humanitarian organizations to make better use of extreme weather forecasts for a forward-looking humanitarian assistance. 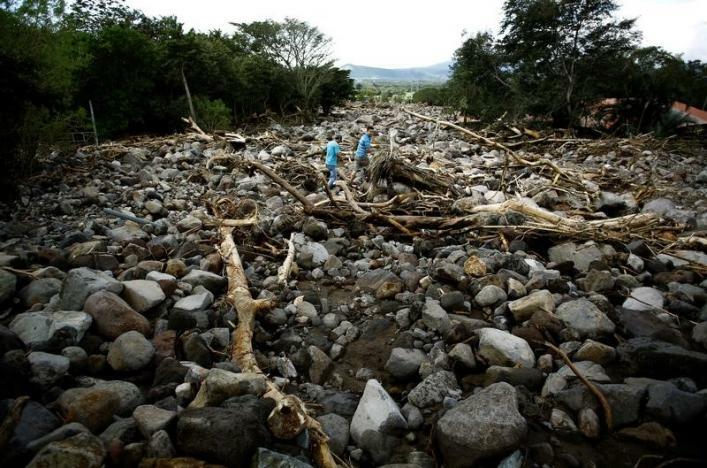 As part of a comprehensive risk management approach in affected countries, climate risk insurance is able to provide rapid post-disaster finance and improve the understanding and ownership of risks. 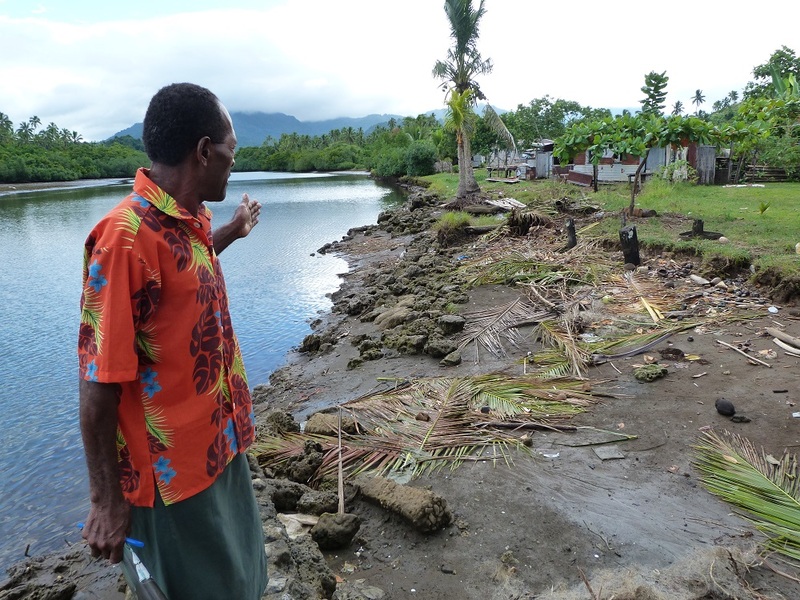 The InsuResilience initiative, for example, aims at significantly increasing the number of poor and vulnerable people with climate insurance coverage. Innovative development approaches therefore need to improve and upscale climate and disaster risk finance and insurance solutions for a more timely and reliable post-disaster response, reducing humanitarian impacts and strengthening local resilience over time. In order to reduce the impacts of climate and disaster risks, comprehensive risk management approaches (including risk-sensitive land use planning and early warning systems) and adaptation strategies are crucial. This is particularly relevant in the context of increased risk of disaster displacement. On the one hand, the protection needs of disaster displaced persons must be addressed. On the other hand, sustainable alternatives need to be promoted and adaptation efforts, including migration as an adaptation strategy, need to be facilitated. There is increased international recognition of the challenge of human mobility in the context of disaster and climate change, as reflected in the COP 21 Decision to establish a Task Force on Displacement under the Warsaw International Mechanism for Loss and Damage and the launch by Germany of the Platform on Disaster Displacement (PDD) in May 2016. States have also committed to address the drivers that create or exacerbate large movements of refugees and migrants, including those linked to disasters and the adverse effects of climate change, by developing a Global Compact for safe, orderly and regular migration (GCM) by 2018. The side event will provide a human mobility outlook (displacement, migration and planned relocation) for and recent experience from Bangladesh as well as share practical examples of Germany´s international engagement for effective practices and approaches that reduce the humanitarian impacts of extreme weather events, integrate risk financing solutions, address the drivers and consequences of displacement and support the most vulnerable to adapt to the adverse effects of climate change. The side event will also formulate recommendations and principles for ongoing policy processes, such as the COP and the GCM, on how these different approaches can complement each other, create synergies and are able to promote concerted efforts at national, regional and international levels. Forecast-based Financing (FbF): Since 2014 Germany is supporting the development of FbF in several high risk pilot countries within its humanitarian assistance in cooperation with the International Red Cross and Red Crescent Movement, the World Food Programme and the Welthungerhilfe. Based on pre-defined risk thresholds, humanitarian financing is triggered at an early stage to enable humanitarian organizations to implement targeted preparedness actions before disasters strike. Climate Risk Insurances (InsuResilience): Following a proposal by Germany, the InsuResilience initiative was launched at the G7 summit in Elmau in 2015. The initiative seeks to increase insurance coverage to protect people against the adverse impacts of extreme weather events. Its goal is to facilitate access to direct or indirect insurance for an additional 400 million poor and vulnerable people in developing countries by 2020. Welcomed by the G20, a Global Partnership is being created to broaden the focus beyond risk insurance and to involve additional actors. Adaptation to climate risks and urban management of climate change related internal migration in Bangladesh: Germany supports Bangladesh with development programs that aim at strengthening the adaptive capacities of the most vulnerable groups in Bangladesh with regard to climate risks and at improving the livelihoods of internal migrants and their social and economic integration in urban settings. Platform on Disaster Displacement (PDD): The PDD is a state-led and multi-stakeholder initiative established in 2016 to follow up on the Nansen Initiative and to implement the agenda for the protection of cross-border displaced persons in the context of disaster and climate change. Germany supports concerted efforts to better protect and assist disaster displaced persons and to prevent or reduce disaster displacement risks. At the same time the PDD also often support voluntary migration as an adaptation measure to the adverse effects of climate change. How could anticipatory humanitarian approaches, longer term disaster risk management, climate risk financing and the mainstreaming of human mobility challenges in the context of climate change complement each other? What are the potential synergies of these approaches that could be used and by whom? What are the major challenges to realize these synergies and to enhance working towards improved cooperation, coordination and action? What are the next steps on policy level that are needed to promote concerted efforts at national, regional and international level with regard to humanitarian assistance, protection, risk reduction, climate change adaptation, migration management and development? What kind of benefits in and across relevant policy and action areas need to be promoted? Government representatives and experts working on relevant issues such as disaster risk finance and insurance, disaster displacement, humanitarian assistance and development cooperation in the context of human mobility will be asked to join the discussion.